You are here: Home / marketing pilates / Have you ever wanted to scream at Mail Chimp or Constant Contact? 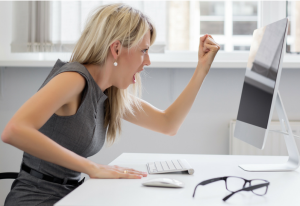 Have you ever wanted to scream at Mail Chimp or Constant Contact? When I worked for the government, we sent out training announcements regularly via email. We started that more than 10 years ago, so technical tools available to help were not quite what they are today. What was our secret to success? We knew that we needed to emulate people who were successful at marketing via email. We subscribed to newsletters. We might have subscribed to a few training newsletters, but we signed up for emails pretty much anytime we visited a website that asked us to subscribe. This got me in a bit of trouble, because our “multimedia department” got really angry with me (and complained to my boss) because I kept coming in with a copy of an email I got from Nordstroms — saying why can’t we do this? 10 years later, I am following the same process for my clients. I subscribe to all kinds of blogs and newsletters, sometimes because I’m interested in their products and services, and 90% because you never know when they’ll give you an idea that will help in your next newsletter! If you scroll down to the bottom of those emails, you’ll usually see what email program they were developed in. While I might not be able to duplicate it exactly – I can usually get close enough to be visually appealing. I am guessing every studio owner, every studio manager, and actually – anyone who has ever signed on to an email program gets frustrated because you’re not sure what you can create, until you create it. You want your newsletters, or letters to clients to be visual appealing, easy to get more information and you want to entice your audience to read articles. Here are my recommendations if you’ve ever wanted ideas so that you have a goal in mind when you’re using Mail Chimp or Constant Contact. Inspiration can come from anywhere. Find someone selling something that appeals to you, and really look at their emails. As technology comes up with solutions sometimes before we know the problem, it’s really hard to know what your email “could” look like unless you’re looking at emails that are coming out from other people. Learn from their creativity. Remember the saying, imitation is the sincerest form of flattery! Much of my Pilates inspiration, has come from the world of rodeo and western fashion. No, I don’t put pics of bucking horses and cowboy boots in my emails – but through the lists I have subscribed to, I get ideas for how to display products and services in the emails I create. Don’t be so proud that you don’t check out the emails of other fitness studios in your area. You want to make sure yours looks equally good or better! If the people know you, and you really don’t want them to know you’ve subscribed, make a generic free email on whatever email program you’re comfortable with and use that. I have one on outlook that actually is set up as an “alias” – so it comes right into my inbox with the rest of my personal emails. Always keep your perfect client avatar front and center. Keep their pain points in mind as you write. You need to convince them to read your stories and buy your products. When you’re working with a particular email, if you want to try something creative, make a copy of what you’re working on, and go ahead and play. If it works, you’ll delete your original, and if it doesn’t work, you still have your original and you can try something else. If you want some ideas or feedback on your current newsletter, send me a message (Becky@Farmgirlmarketingsolutionslcom)! I’m happy to give you some feedback! When in doubt, look to Nordstroms. I’ve always found them to be a good source of ideas! Inspiration can come from anywhere. Find a system that works for you to keep track of your ideas. I take screen shots of things that impress me — and then when I need to make a flier or a graphic – I go thru my ideas to find something that aligns with what I’m trying to design. Yes, it means more email that you have to read, but it may also mean more dollars that you can take to the bank! If you’d like help with your struggles with developing emails, set up a complimentary consultation with Farm Girl Marketing Solutions. And just so you know, Farm Girl Clients get an idea message from me every single week to inspire them with class ideas, graphic ideas, and great copywriting! Previous Post: « 10 Tips for Your Visit to Cowboy Christmas!